A room or series of rooms where works of art are exhibited. From the French word meaning “kind” or “genus.” A realistic style of painting that depict scenes of everyday life. Dutch artworks of peasant and tavern scenes are considered typical genre paintings. Click for more information about genre art. A mixture of plaster, chalk, or gypsum bound together with a glue which is applied as a ground or coating to surfaces in order to give them the correct properties to receive paint. Gesso can also be built up or molded into relief designs, or carved. Click for more information about gesso. (Pronounced “zee-clay”) a printmaking process usually on an IRIS inkjet printer to make reproductions of a photograph of a painting; the printer can produce a very wide range of colors resulting in prints that are of very high quality. An acronym for “Graphic Interchange Format”, an image format type generated specifically for computer use. Its resolution is usually very low (72 dpi, or that of your computer screen), making it undesirable for printing purposes. A phrase meaning to add unnecessary ornamentation to something already beautiful. A thin layer of translucent acrylic or oil paint applied to all or part of a painting, to modify the tone or color underneath. Glazing is the process of using this technique. An extremely thin tissue of gold used for gilding. The basic building blocks an artist uses to organize or arrange the various elements that comprise a design or composition within a work of art. The principles are: Balance, contrast, emphasis, movement, proportion, space, unity, and visual economy. Also referred to as the principles of design or the principles of composition. For more information on this subject, please see the discussion on each of the composition principles. A type of watercolor paint, made heavier and more opaque by the addition of a white pigment (chalk, Chinese white, etc.) in a gum arabic mixture. This results in a stronger color than ordinary watercolor. Two-dimensional art forms such as drawing, engraving, etching and illustration in their various forms. The applied art of arranging image and text to communicate a message. It may be applied in any media, such as print, digital media, motion pictures, animation, product decoration, packaging, and signs. Graphic design as a practice can be traced back to the origin of the written word, but only in the late 19th century did it become identified as a separate entity. A soft, black, lustrous mineral made of carbon used in lead pencils, paints, crucibles, and as a lubricant. Refers to the range of gray tones between black and white (see illustration). Refers to a series of crossed lines that meet to form a boxed pattern used in the predetermined placement of photographs and graphic elements on a canvas. Useful in creating compositions. 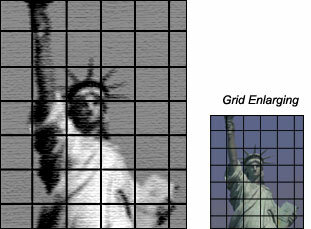 The process of using a grid to enlarge an image; for copying very precisely, another image, on the same or a different scale, usually larger; used in scaling an image by drawing (see illustration). For more information on how to use this method, see article titled “Using a Grid to Enlarge and Transfer an Image to Canvas“. Monochrome painting generally employing shades of gray executed in a black pigment and an inert white pigment in oil, gouache or tempera; a stained glass window incorporating muted tones as opposed to bright colors.